A complete indoor movie rental package for up to 50 viewers, incl. projector, DVD player, speaker & 6' screen. This indoor movie projector and screen rental package provides everything you need for a high quality, indoor movie experience for up to 50 people. Incredibly easy to setup. 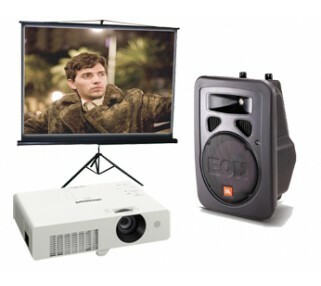 This package includes a bright projector, DVD player, 6' tall projection screen, high quality speaker and all the cables you need. When you pickup your movie night package rental, we will show you everything you need to setup and run the movie yourself. We back that up with 24/7 free phone technical support, in the event you experience difficulties during setup. Click here for tips on how to make your movie night party an evening to remember!